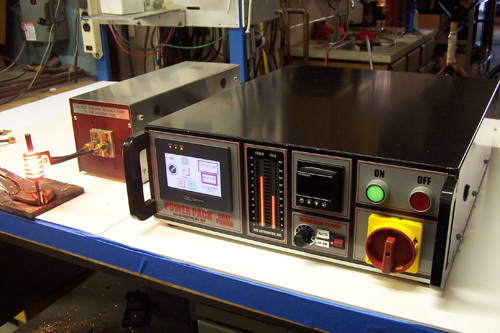 This unit has most of the features of the larger induction systems, but is more compact and certainly useful for laboratory induction heating applications. It can be mounted on a flat laboratory bench, as shown, or mounted in a 19" rack cabinet. The heat station with heating coil is external and can be mounted 3-10 meters from the power supply. Power levels available are 3.0, 5.0 and 7.0 kw. 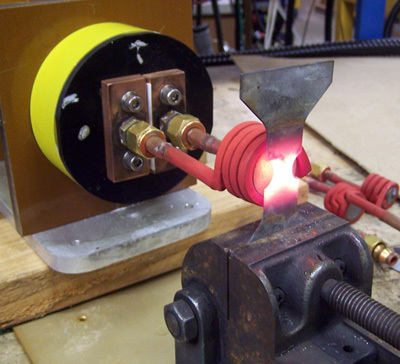 Heating steel samples under dynamic stress for metallurgical study.